Proudly meat free. Satisfyingly simple. High in protein and fibre. Vegetarian Society approved. 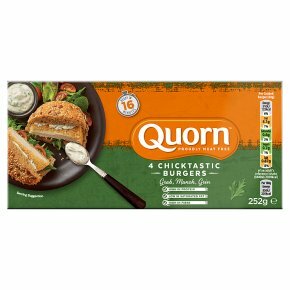 A delicious Quorn vegetarian chicken burger encased in crunchy breadcrumbs. Great for tea times, what will you have with yours? Remove all packaging.Preheat oven and baking tray to 220°C/Fan 200°C/Gas 7.All appliances vary, these are guideline only.Check product is piping hot before serving.